I’m not a religious person, but our grandparents are very Catholic. So when they visited us, I made a special road trip with them to Częstochowa (see map), which is home to Poland’s most important pilgrimage site, the Jasna Góra Monastery. 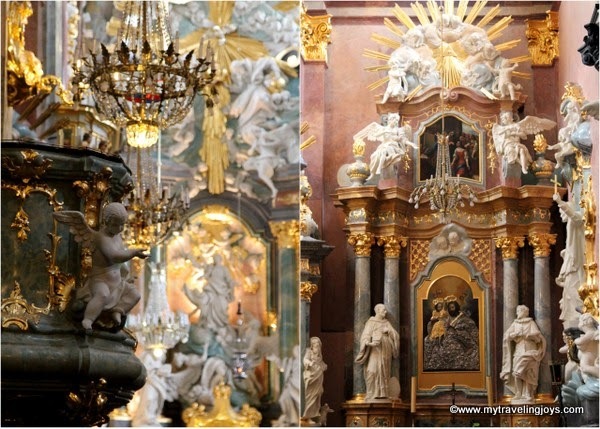 Every year, millions of tourists flock to the monastery to see the Black Madonna of Częstochowa, a revered icon of the Virgin Mary which has been the object of pilgrimages since the 14th century. During our June visit, we encountered hundreds of tourists at the monastery and had to time our visit just right so we could actually see the Black Madonna painting. This revered icon is only unveiled at certain times, so be sure to check out this website before you plan your trip. Numerous legends surround the Black Madonna, which could date back to 400 A.D., when it traveled from Jerusalem to Constantinople (now Istanbul) and survived a fire. The icon eventually ended up in the hands of an advisor to the King of Poland and Hungary and was left at the Częstochowa monastery because of a vision in 1384. In 1655, the Black Madonna was credited with saving the monastery against the Swedish Invasion where the monks successfully held off the Swedes for 40 days. Since then, the icon has been credited with numerous miracles such as healing sicknesses. Even if you’re not religious, the Black Madonna, secured behind a golden gate, is a pretty sight to see. I just cannot imagine believing in something like that strongly, but plenty of people do. Our grandparents were very happy to see the Black Madonna so that’s all that matters. We also visited the inside of the monastery’s ornate basilica, which dates back to 1695. How this beautiful church survived WWII is a miracle to me! After our visit, we wandered to one of the nearby restaurants, which served decent Polish food, but nothing special. You could easily include Częstochowa as part of a daytrip from Warsaw or as stop along the way to Krakow, which is what we did. 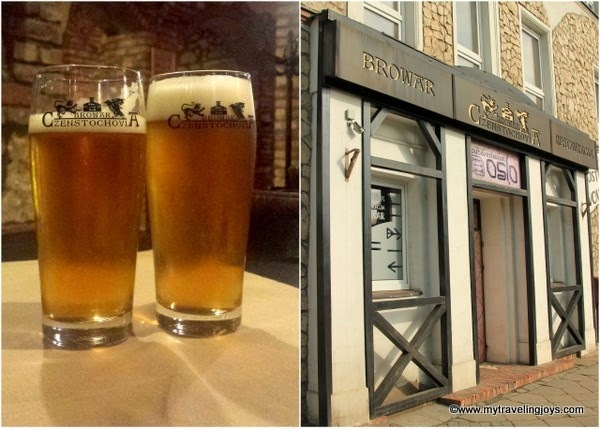 We stayed the night at Browar Czenstochovia Hotel & Spa, a wonderful boutique hotel in a restored brewery. Luckily, this hotel served really good food and locally-brewed beer! 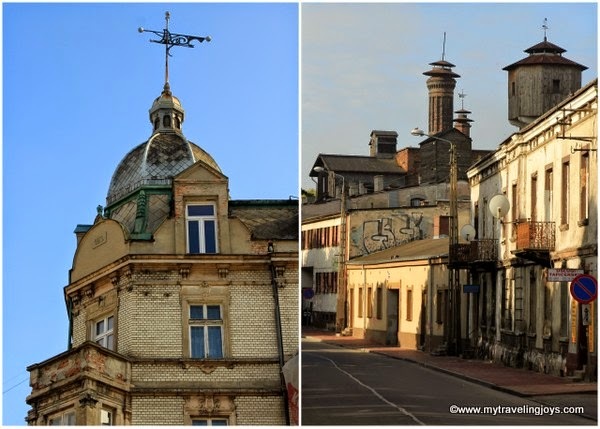 Have you visited or would you like to visit Częstochowa? International flags line the walkway leading up to the Jasna Góra Monastery. Stare Miasto (Old Town) has several interesting old buildings including the Franke's House, built in 1903, which belonged to Adolf Franke, an owner of a textile mill. The building housed a German hospital and army hotel during WWII and now has offices and shops. St. Sigmund’s Church, originally built in 1350 but badly damaged during WWII, sits in the middle of Stare Miasto as well. The Neo-Gothic Holy Family Cathedral of Częstochowa, is one of the largest churches not only in Poland but Europe as well. It was built in stages from 1901-1927 of red brick and sandstone details. I didn't have a chance to peek inside, but the exterior is beautiful. Our Lady of Częstochowa Orthodox Church, ul. Kopernika 23, is a rare Orthodox church in central Poland. Parku Miniatur, located in a old quarry, features miniature versions of religious shrines from around the world as well as a gigantic 13.8-meter (45.3-foot) white, fiberglass statue of Pope John Paul II. We drove around the park so grandma could see the statue, but I refused to pay the ridiculous 25zl admission fee. The Holy Virgin Mary Avenue (Aleje Najświętszej Maryi Panny) leads from St. Sigmund’s Church in Stare Miasto to the parks in front of the Jasna Góra Monastery. More History of the Black Madonna of Częstochowa. So ornate - After the simplicity of mosques, I think I crave some religious pomp and glory. wow...what a place. i would love to go there! Well, the Catholics seem to have plenty of that here! The churches are all very ornate! I went to the university in Częstochowa and had a blast there! It's not the most exciting city ever but it was so much fun studying there :) good times!